Congratulations on your engagement or renewal. Having your event photographed is one of the most important aspects of your day. Taking portraits of a wedding involves a process of telling a story... a story made up of many special moments. I love capturing joy during your ceremony that you in turn can reflect on and share with loved one’s for many years to come. Many people ask what my ‘style’ of photography is....I take both candid and posed shots. Taking pictures of those moments that you did not see during your ceremony tend to be very treasured images. The traditional poses which include bridesmaids/grooms/family members are very important as you’ll look back on them for many years to come. In addition to weddings, I also enjoy watching two people re-affirm their love for one another in renewal ceremonies. Elopements are very special as it is a moment for just the two of you and having pictures to share with others is of the utmost importance. During your ceremony I will take an unlimited number of portraits. Within about 4 - 6 weeks (6-8 weeks for larger weddings) you’ll have all of your portraits on a private/online gallery. Your gallery will be password protected and can be shared with anyone you wish. You may have friends and family that were not able to attend your event, this becomes a nice way for them to see your day up close and personal through your portraits. You will also receive a digital download of all images taken in high resolution with a photographer’s release (meaning you can download the entire gallery - and so can friends and family - on your device and you can also get them printed at any photo lab - although we recommend professional labs for the best quality). The photo release gives you the ability to print those images (there is not extra cost for the release). All images will be fully edited and adjusted. For more information on what that means and to see examples of before/after pics please click on this link. On average you will receive between 80-100 images (sometimes more) per hour of shoot time. One of the most popular additions to our photography packages is the Movie slide show. A wonderful memory to share and reflect back upon. Samples of these can be found on my Movie Slide Show gallery. For my latest reviews, please visit my listing on Wedding Wire, Yelp or my site at Heidi Borgia Photography. 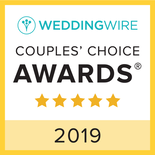 I have won the Couple's Choice Award from 2013-2019. Please note that for our packages one of our associate photographers may be the lead photographer in the event Heidi is already booked on that particular day. Please inquire at the time of your booking.